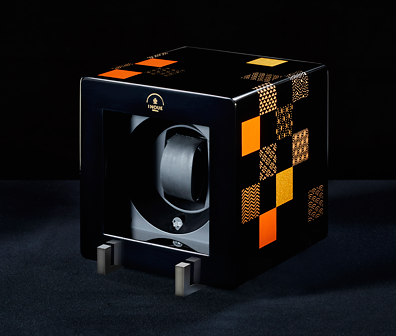 Watch winder ̶ an artistic product that preserves a value of wrist watch as it has been made ̶ simply needs two core essences, security and solidity. With such an importance of its function, what does it take to create its casing for display? Regardless to say, aesthetic beauty, high quality, and durabili ty are considered as minimum and fundamental ethos. What is more and most important is a “story” , that defines the existence of the masterpiece. That ultimately allures people. More than 400 years ago from now. As the world shifts from war era to peace era, craftsmen from Hikone, who were specialized at the production of armors, shifted its expertise to Buddhist altar a nd continued refining their artistic skills. INOUE emerged to the world more than a century ago. INOUE has been valuing ove r hundred years of craftsmanship skills, with a fusion of modernity to create a story that is coherent with the current context. Inoue’s techniques have accumulated been passed down over 350 years of crafting Japanese Buddhist altars in the town of Hikone. Elite craftsman, called the “Seven Masters,” employ their superior techniques to shape materials such as wood, metal, and lacquer. Today, more than 100 years since the founding of Inoue, our artisans prioritize cooperation with one another in their pursuit the possibilities that can be realized through application their crafts. In these modern times, we take pride in engaging in the peak of Japanese Buddhist altar creation. The Japanese word “Shihou” refers to the four (shi) cardinal directions (hou). This piece is designed as the shell to house a cubical winder. 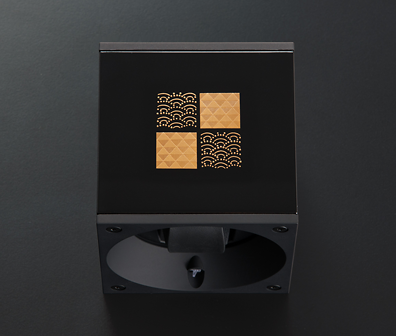 By adapting techniques ranging from origami to tea ceremony rooms, we created a high-end square shaped “box.” However, this is not just a container to put something in, this piece encases a winder by enveloping it within Japanese culture. As the name suggests, the Shihou is a piece that is finished with lacquer across all four directioms. It is finished on all sides with a makie, which is method of Japanese lacquering in which, originally, powdered gold or silver are brushed into imeges drawn on the surface of the lacquer. 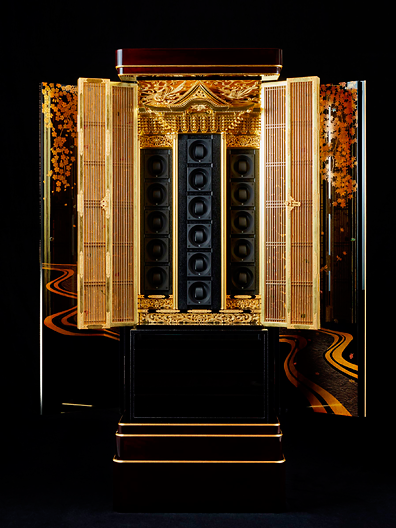 The Shihou's makie evoke a feeling of elegance. on e of the most prestigious winders. The main body is constructed from Japanese hiba cypress. Hiba wood is known for its durability, and has been used in building homes and furniture in Japan since antiquity. Japanese lacquer, called urushi, comes from the sap of the Japanese urushi tree. The sap is used after it is filtered to remove any dirt or other particles. Through being exposed to the moisture in the air, it hardens into one of the strongest protective coatings in the world. Makie is a technique of affixing images onto the surface of lacquerware by drawing pictures and embedding usually gold or silver powder into them with a brush. This unique method of lacquer artistry first began in the 8th century. Each design pattern in this piece is incorporated one by one, and they are all traditional Japanese patterns with superb sophistication and aesthetic sense. 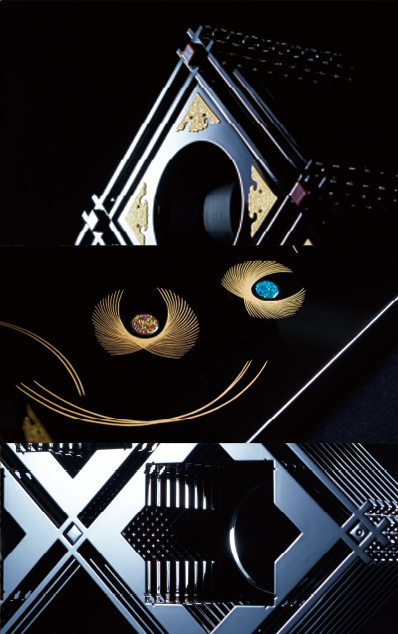 The Hafu is formed using the Japanese technique of kumiko, a process of joining and assembling wood into a structure without the use of nails, to create breathtakingly elaborate and beautiful works. 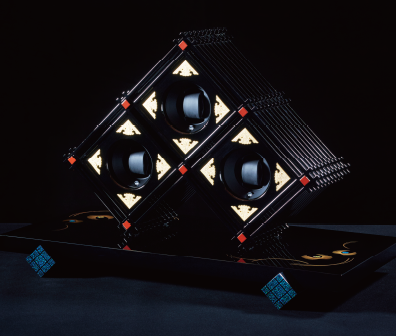 The framework is made using kumiko techniques to arrange winders into a triangular position that brings to mind the curved roofs of Japan’s traditional architecture and the peaks of its sacred mountains. The framework employs the kumiko technique, which maintains an heir of delicateness, while at the same time it is built to be sturdy. 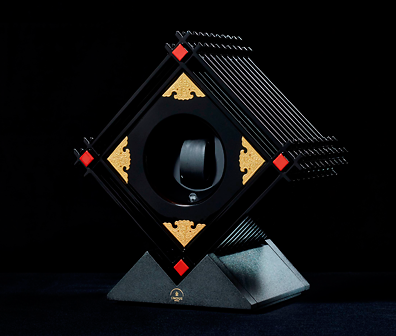 The front surface is finished with black lacquer and the central section is emblazoned with gold fittings, giving the piece a sense of power. The triangular shape is a design reminiscent of the hafu style used in the roofs of traditional buildings. 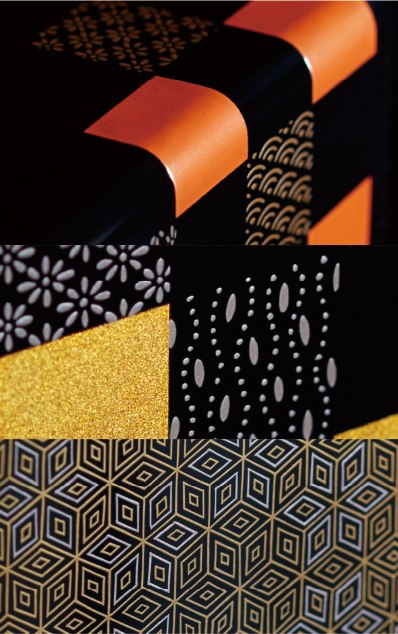 Kumiko is used in a variety of forms throughout Japan. Without using any kind of nails, pieces of wood are fit together firmly to create an exceedingly strong structure. The base employees a new lacquer craft called saikiko. This is an expression of lacquer made by setting small “Kyoto Opal” stones into the lacquer and coating with lacquer that is burnished smooth. Hafu is a traditional design seen often in Japanese roofs. It refers to the upward curving at the edges of triangular Japanese rooves. It is often used to augment the grandeur of buildings such as shrines, temples, and castles. Metal fittings on the surface of the four corners enhance the design while hiding the joints from being visible and highlighting a contrast between the materials. 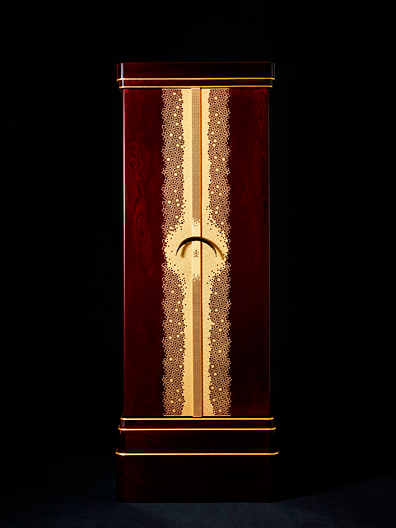 The most unique characteristic of that the enclosure made by masugumi, a technique of precisely assembling of pieces of wood, that is coated with a tamenuri style of lacquer finish. 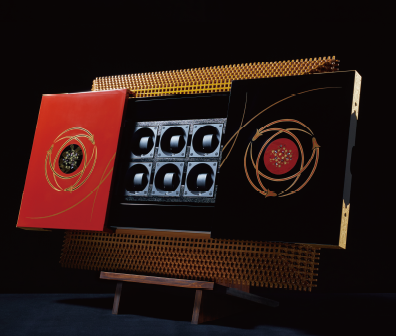 The sliding front door is decorated with Japanese traditional designs using the raden technique of inlaying mother of pearl, and the hyomon method of applying a thin layer of gold over the lacquer. Metal: (Door) pressed gilding with burnishing. 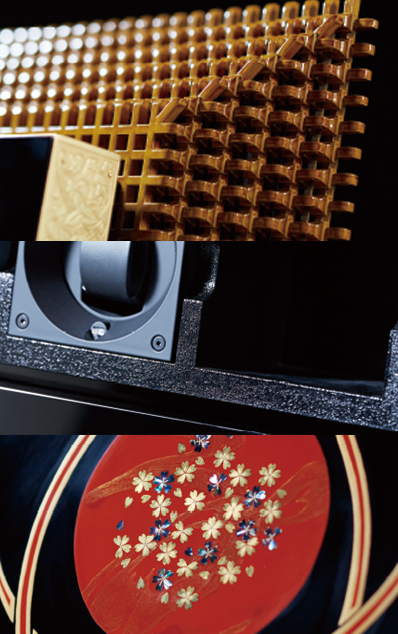 In the tamenuri lacquer technique, over the foundation layer, a middle coating of colored lacquer is applied, then on top of that a clear coat is applied so that the colors of the lower layers will show through to the surface. Hyomon is a method of makie in which a thin layer of gold is used to create a picture in lacquer. The gleam of the gold brings out an image that shines as only pure gold can. In roiro, or highly-polished lacquer finishing, a lacquered surface is burnished flat and then raw lacquer is applied repeatedly. Finally, it is polished to achieve a mirror-like sheen. This method represents the very highest quality of lacquering. 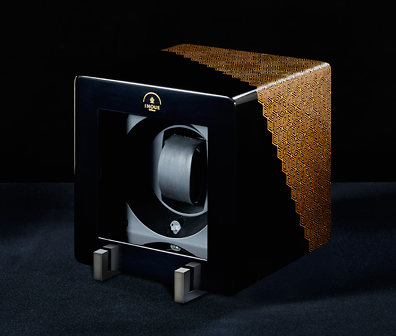 DAN Spec, the largest winder casing, is attributed to aesthetic finish that is derived from wooden grain. The entire techniques of Hikone craftsmen are introduced on this masterpiece. The back of door displays the seasonality of spring and fall - with details in all essences - makie, metalwork, woodwork- are meticulously catered by craftsmen. 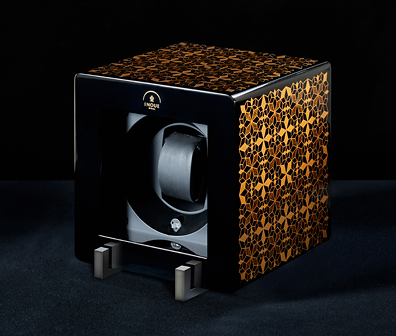 This casing caters 16 winders - an ultimate casing to rest valuable wrist watches. Makie is a technique of affixing images onto the surface of lacquerware by drawing pictures and embedding usually gold or silver powder into them with a brush. Th is unique method of lacquer artistry first began in the 8th century. ln roiro, or highly-polished lacquer finTshing, a lacquered surface is burnished fiat and then raw lacquer is applied repeatedly. Finally, it is polished to achieve a mirror-like sheen. This method represents the very highest quality of lacquering. Copyright (C) 2015 INOUE Inc. All Rights Reserved.